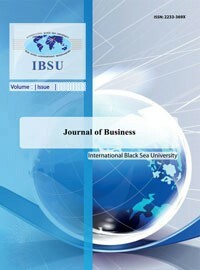 The Journal of Business (JB) is an official scholarly referred multi-disciplinary peer-reviewed scientific journal of the Faculty of Business Management of International Black Sea University, issued twice a year, spring and fall. Journal of Business publishes scholarly works in the field of business management and administration concentrating on theoretical and practical issues of business activity including cases of business experience.The aim of the Journal of Business is to analyze different issues and provide readers with new perspectives and topics in business studies. This is achieved by publishing innovative, thought -provoking and analytical articles in diverse fields. The Journal of Business is designed to foster the dissemination of ideas and research findings related to the business studies. Its purpose is to bridge diverse communities of scientists and business persons, and provide information and debate on subjects of interest to diverse readership. Journal of Business is accepted by Scientific Indexing Services, Academic Resource Index – Research Bib, Directory of Research Journal Indexing and International Scientific Indexing. The interested contributors are highly encouraged to submit their manuscripts/papers from the Journal of Business online submission system to send their manuscripts for possible publication.